Short on time? Let solar-heater sellers contact you. 1.Stylish slim line design 2. Thermosiphon operation minimises maintenance 3. Electric booster models available 4.Inner tank with vitreous enamel or SUS304 5. Collector absorber with black chrome coating 6. Unpressurized system 7. Reliable, low maintenance operation 8. Flexible option of collector and tank capacity 9. Enhanced protection for maximum life 10. Easy mounting and installation. Beijing NP Solar Co., Ltd. Detailed products description: 1. Certificate: Solar keymark. SRCC. 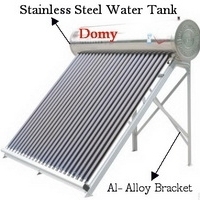 Watermark, Standardmark 2. non-pressure solar water heater 3. 15 years of lifetime 4. high efficiency and good heat conductivity 5. intelligent control ,display the temperature all the time. Specification: Storage tank volume Outer casing: aluminium alloy thickness :0.5mm Inter tank: SUS304 2b stainless steel Insulation layer: polyurethane foam /rock wool for optional Inlet and outlet: SUS304 2b Heat preservation: 72 hours Welding: Arg welding Vacuum tube Number of tube: 20L ,24L,26L,28L,32L for optional Tube length: 47*1500/58*1800/47*1800 for optional Heat absorption rate : 91% Thermal damage rate: ULT =0.82W/(m2) Coating of vacuum tube: AL/N/AL Heat pipe: anti-freeszing>-35 Hail resistance: 25mm Working pressure: 6bar Max test pressure:12bar Max working temperature: 280C Tube holder: UV stabilized nylon Support Aluminum alloy. Ravisons Solar Energy Pvt. Ltd. Type of collector: ETC Specification: 47*1800mm Number of tubes: 12, 15, 18, 24, 28 Frame Angle: 27 degree Inner tank materials: Food Grade Stainless steel Tank volume: 100L-250L Outer tank: Powder coated/Stainless steel Number of persons to use: 3-8 Benefits of solar water heaters: 1. Better Performance in winter and cloudy days 2. No scale Formation will occur by using salt &hard water 3. Compressed PUF insulated Storage tank to retain the hot water for more than 48 hrs. 4. suitable for bore well and hard water usage 5. All fasteners are made of SUS 304 food grade for rust free 6. ISI marked 1.5kw back-up heater with thermostat (optional) 7. Replacement guaranty for 5 years and free services 8. Minimum product life span of 25-30 years. 9. No electricity needed and very eco-friendly. Specification: 47*1800mm Number of tubes: 12, 15, 18, 24, 28 Frame Angle: 27 degree Inner tank materials: food grade stainless steel. A.O. Jack Group Technology Co., Ltd. It also has such merits as strong and compression-resistant outside, with new craft and new material. Simultaneously we have also solved the problems which have puzzled the domestic and foreign experts. We take the quality as a foundation, take the service as a core, pays attention to the detail as the key point and take the standard service as the guarantee. With advanced science and technology. Features: + Stylish slim line design + Thermosiphon circulation minimises maintenance + Electric booster models available + Inner tank with stainless steel SUS316 + Collector absorber from Germany Bluetec company. Benefits: + Save 55% to 85% of your energy consumption for water heating + Reliable, low maintenance operation + Reduce up to 3.2 tonnes of CO2 emissions every year (300L system) + Flexible option with options of collector and tank capacity + Strong design to withstand extreme weather condition such as typhoon-frequent region + Open or closed circuit available for different climate and water quality + Easy mounting and installation + Enhanced protection for maximum life + Work life is over 15 years + Details of the Product and quality is important for us. Features: + Stylish slim line design + Forced circulation minimises maintenance + Electric booster models available + Inner tank with stainless steel SUS316 + Collector absorber from Germany Bluetec company Benefits: + Save 55% to 85% of your energy consumption water heating + Reliable, low maintenance operation + Reduce up to 3.2 tonnes of CO2 emissions every year (300L system) + Flexible option of collector and tank capacity + Strong design to withstand the extreme weather condition such as typhoon-frequent region + Open or closed circulation available for different climate and water quality + Easy mounting and installation + Enhanced protection for maximum life + Work life is over 15 years + Details of the Product and quality is important for us. Features Stylish slim line design Forced circulation operation minimises maintenance Electric booster models available Inner tank with porcelain enamel Collector absorber with black chrome coating Benefits Save 55% to 85% of your energy consumption for water heating Reliable, low maintenance operation Flexible option of collector and tank capacity Strong design to withstand the extreme weather condition Open or closed circuit available for different climate and water quality Easy mounting and installation+ Enhanced protection for maximum life Worklife over 10 years Details of the Product and quality is important for us. Features: Stylish slim line design Thermosiphon circulation minimises maintenance Electric booster models available Inner tank with stainless steel SUS304 Collector absorber with black anodized coating Unpressurized system with no coil in tank. Automatic control. Benefits: Save 55% to 85% of your energy consumption water heating Reliable, low maintenance operation Reduce up to 3.2 tonnes of CO2 emissions every year (300L system) Flexible option with options of collector and tank capacity. Strong design to withstand the extreme weather condition Open or closed circuit available for different climate and water quality. Easy mounting and installation. Enhanced protection for maximum life work life over 8 years Details of the Product and quality is important for us. Changzhou Skylight New Energy Co., Ltd.